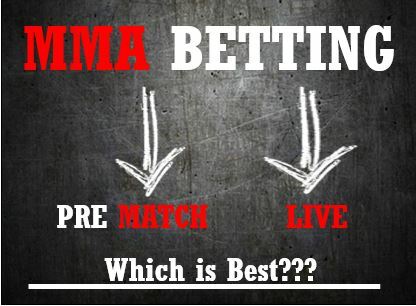 What is Live MMA Betting? Put simply, live MMA betting is placing a bet on a fight as it takes place. Most people are doing it on their phones right now. Generally, when betting on UFC or MMA you place bets before the event and then wait to see how it plays out, this is called Pre Match Betting. Sportsbooks allow you to place bets while the fight is actually happening, which gives you access to different sets of odds and prop bets that can maximize your ability to profit. This form of MMA betting is still in its infancy, which means that you might find your options limited, but is a major growth area for anyone who wants to bet UFC fights. *Live betting is also known as In Play betting. How Does Live MMA Betting Work? 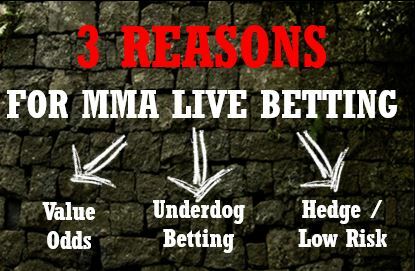 Most sportsbooks offer three types of live bets during fights amongst other MMA bet types. You can bet on who will win the fight, how they will win the fight, and in which round the fight will be won. In the United States most sportsbooks will only update the odds in between rounds. UK sites might offer a few more options, as sites like Ladbrokes use dynamic odds throughout a fight. 1. 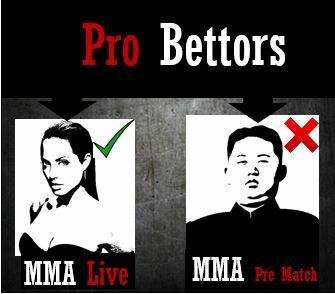 Live betting offers a variety of interesting value propositions that aren’t available before a fight begins. For instance, betting on a heavy favorite tends to offer fairly terrible odds before the fight begins, instead make a bet after that favorite just had a poor first round to capture better odds and expect the fight to turn around. Alternately, sometimes betting on a huge underdog is too risky despite the potential huge payoff. To check out which fights will be featured today or in the near future visit ESPN Go MMA Schedule (source 1). Not only can you review the time and date, by clicking on the Fighter´s link you can see his/her profile, fighting record, recent interview and style analysis. 2. Betting on a huge underdog against a heavy favorite who seems to have hurt his knee in the second round is an entirely different matter. To hedge against these type of scenarios it is always wise to know what the 4 fighting strategies are and watch how the fighter applies them during the fight. Bleach Report published an article listing the biggest upsets in MMA history and goes on to explain when basic strategies fail, “MMA´s, Calculated Errors: The Best Strategies Aren’t Always the Best Decision” (source 2). 3. Live betting is also good for anyone looking to hedge and guarantee a profit. Maybe you placed a bet on a big underdog to survive a couple of rounds, but he isn’t looking too well near the end of round 1. You can cancel that live bet quickly and take the opposite by betting on the favorite. *Checkout these 4 basic strategy tips to win at MMA betting. All bettors begin with Pre Match betting regardless of the sport, but in time they realize how often their analysis is sacked by late-time injuries, sickness and other occurrences you cannot control. With Inplay Betting bettors can process information as it happens and adjust their decisions making even more money from a single fight with multiple bets. There is no need to spend countless months getting to that experienced level, you can begin a successful betting career by following pro MMA tipsters on social media. Find them on twitter, the best social platform for live MMA betting tips.